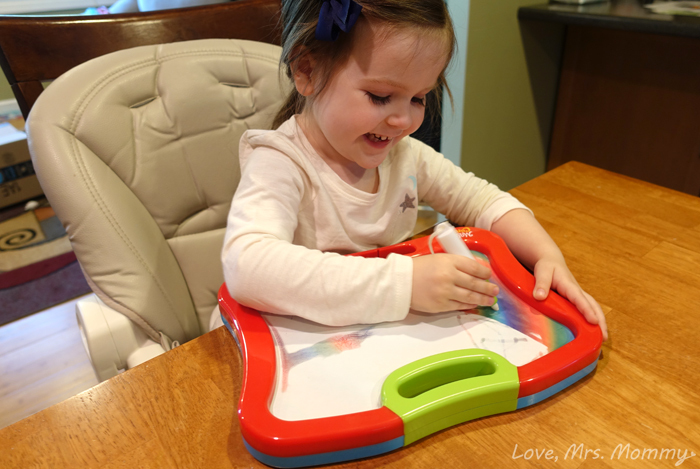 Love, Mrs. Mommy: Magic Canvas Makes Drawing A Colorful Surprise, Every Time! Magic Canvas Makes Drawing A Colorful Surprise, Every Time! I received a Magic Canvas at no cost to facilitate this review. All opinions are my own. Encouraging children to learn and be creative is very important. Their brain is developing at lightning pace and by giving our children products that help to foster this amazing growth, it’s always a plus! That’s why, when I found out about Magic Canvas, I had to give it a try with my daughter! Magic Canvas is a dual-sided board that comes with 1 stylus that you fill with water. Once filled, your child can draw with it to unveil a rainbow spectrum of colors! As these colors magically appear at the surface, your child’s drawing will take on new creative heights! The canvas size is quite large at 13 x 1.5 x 10.8 inches, but it’s still small enough to transport and even take in the car! Plus, with its weight at only 11.2 ounces, and it’s trusty handle, your child won’t have any trouble holding onto it or carrying it around. Perfect for on-the-go fun! Once your child has created a masterpiece of their very own, they can either wait for the water to dry on that side, or they can just flip the canvas over and start their next drawing! Definitely a genius idea, as more kids than not, are impatient and don’t like to wait. I definitely appreciate that it’s re-usable and you don’t need to buy any replacement papers, inserts, or other accessories. Plus, it's extremely responsibly priced at only $16.95! Awesome! My daughter has had a blast playing with her Magic Canvas for the past few weeks. I wanted to give it a really good test, because my daughter is still very young and she can be rough with things, and I wanted to see how it would hold up to her play. Right away she was amazed at all the colors that showed up when she drew. Suddenly, her puppies and rainbows looked even more amazing! The smiles and the joy on her face told me that this toy was just what she wanted to help bring her imagination to life. Not only does my little sweetie like to draw on her canvas, but she likes to completely fill in the board! 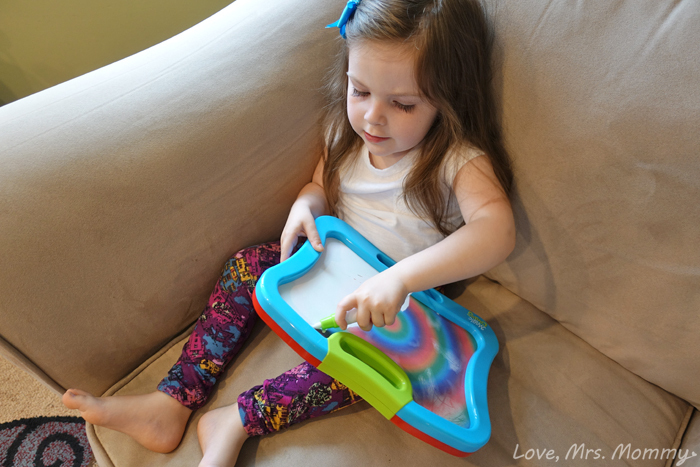 She colors every square inch with the water stylus and loves seeing the beautiful rainbow pattern that magically appears. She’s always very proud of herself when she completes it and loves to show it off to me. So sweet! My daughter is still a little rough with toys, as she’s only 3 years old, and I only have one comment that is less than a super shiny note about this toy. It’s that when she first discovered that underneath the white layer, there were a bunch of other colors, she tried scratching at the surface to uncover them. By doing this, it did scratch the coating on the canvas. As my daughter continued to play (even later that same day), she stopped doing this thanks to my prodding. However, the damage was already done. I was thankful to see though, that it didn’t hinder my daughter’s creative designs. All her pictures still look beautiful and she adores playing with it! Overall, this product is definitely recommend-worthy! It’s a great travel accessory for the car, playtime at home, and even to bring over to the grandparents for some creative fun! It’s age appropriate for those 12+ months and up and as long as you have water handy, you are good-to-go! My sweetie loves it and I am sure yours will too! Connect: Find out more about Magic Canvas by visiting the PlaSmart website. Then make sure you “like” them on Facebook and follow them on Twitter. Buy It: You can purchase your very own Magic Canvas on Amazon for only $16.95! I would love to have this for my granddaughter, she loves to draw but also makes a big mess while doing so, I love that this is mess free!! That looks like so much fun! My daughter would love to have this and it looks nice for me being mess free! Oh my your little princess is beautiful.Thanks for the giveaway ! So super neat!! I love all the colors and no mess!! No mess is GENIUS in this house lol!! This is cool. I had something like this as a kid. But it wasn't this cool! Absolutely going on the Christmas list this year! My nieces are constantly drawing. They would enjoy this. This would keep my grandson busy for hours. He loves to draw and he challenges his imagination with new things to draw like people flying around with jet packs. It's always fun to watch him draw. This kind of reminds me of an Etch-A-Sketch but with colors. Kids can show their creativity using it. My grandson will love this!! Thanks for the giveaway! 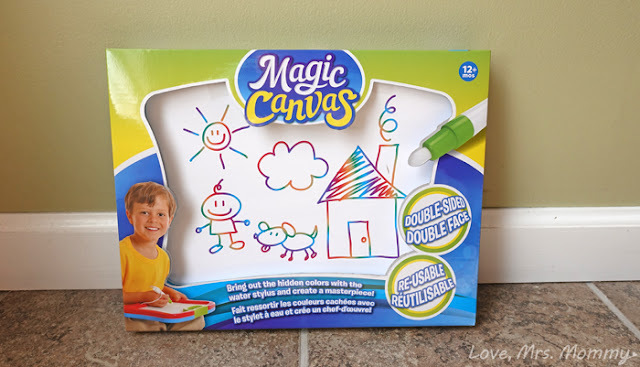 I like this Magic Canvas for my granddaughter who loves to draw. It's lightweight and has a handle making it convenient to carry. Perfect way to occupy her in the car. This is an awesome travel game and will keep children busy for a long time! This looks like so much fun. My 5 year old granddaughter would love it. This is really cute and creative. My granddaughter would love this! Thanks! I love this, I love that this is made for small fingers, I like the ease of using this and so much fun! I think this would be so much fun for my 2 yr old and much cleaner for my furniture than crayons or paint! 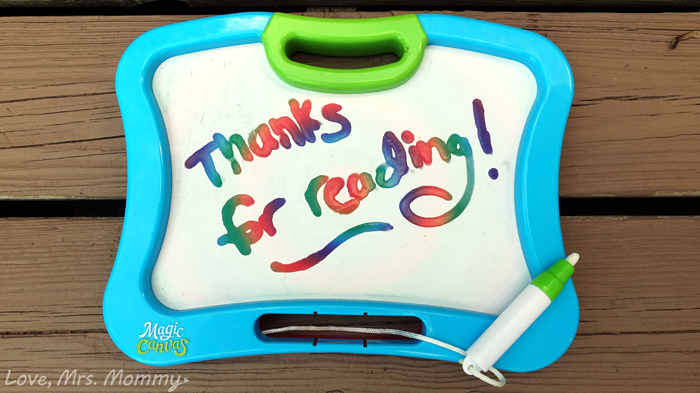 This would be an awesome tool in teaching handwriting to my grandson, as well as for play! This reminds me of those magnetic drawing boards I used to have except these look so much easier to use and is much more colorful. This is on my daughter's Christmas list as of now! My daughter is in Kindergarten and is practicing her writing, I think she would love to write with rainbow colors. My Grandkids would love this. They love coloring and the scratch off color sheets. This would make an awesome Christmas gift. My granddaughter would love one I am sure.